Largehearted Boy: Book Notes - Amy Stewart "Girl Waits with Gun"
Book Notes - Amy Stewart "Girl Waits with Gun"
Amy Stewart's debut novel Girl Waits with Gun is a compelling historical mystery filled with unforgettable characters. "Stewart has spun a fine, historically astute novel... The sisters' personalities flower under Stewart’s pen, contributing happy notes of comedy to a terrifying situation... And then there is Constance: Sequestered for years in the country and cowed by life, she develops believably into a woman who comes into herself, discovering powers long smothered under shame and resignation. I, for one, would like to see her return to wield them again in further installments." I'm lucky that the Kopp sisters' story began in 1914, a year that I can at least recognize from here. (I don't know how Hilary Mantel manages to write authentically about 1500, but I would love to hear her playlist.) To get Constance's voice right, I felt the need to immerse myself in pop culture of the 1910s, which meant reading that era's trashy fiction, women's magazines, and newspapers. I read play scripts to get an idea of what people were seeing--and laughing at-- on stage. And, of course, I listened to music from the era. The youngest Kopp, Fleurette, was sixteen when the book began, and already in love with music and dance. She was always singing around the house, or putting on records to dance to. This is just one of many details taken from their real lives: Fleurette actually was a soprano, and would go on to enter signing competitions around Paterson and Hackensack. So this is actually Fleurette's playlist. They're sweet and silly songs that a girl of her age would have been drawn to. And they're all quite fun to sing, which is important when you remember how popular songs circulated in those days. Fleurette would have gone into a music shop to look at new sheet music releases, and a store employee would have been sitting at the piano, belting out the latest songs in the hopes of selling a few. In those days, songs were meant to be sung, preferably at a party, with plenty of audience participation. "When Father Papered the Parlor" was a big hit in 1910. Fleurette would have been about thirteen when it came out, and it probably struck her as hilarious. Silly Dad, making such a mess with the wallpaper paste that the whole family gets stuck! 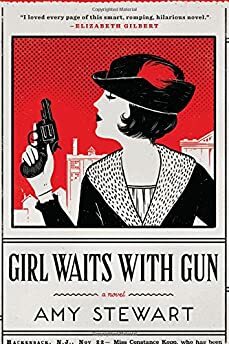 Girl Waits with Gun begins with a car accident, and really, that's an appropriate way to begin any book set in 1914. The automobile was on the rise, but it hadn't totally taken over yet. Roads were bad, people still relied on horses and buggies in many parts of the country, and cars were notoriously unreliable. As evidence I submit the 1913 "He'd Have to Get Under – Get Out and Get Under (to Fix Up His Automobile)," recorded by Al Jolson and also by Billy Murray. It's all about a poor fellow who can barely manage to woo his girl, he's having to spend so much time hopping out to work on that new-fangled machine of his. And then he'd have to get under—get out and get under—and fix up his automobile. As long as we're doing car songs, Irving Berlin wrote one in 1912 that's even more appropriate: "Keep Away From The Fellow Who Owns An Automobile." In his machine, and I just mean to kind o' warn each girl! Yes. Men in cars were not to be trusted. Finally, I must include at least one union song, even if Fleurette would have only heard it on the street in passing. My novel is set against the backdrop of the 1913 Paterson Silk Strikes, one of the most famous moments in the history of the American labor movement. It was organized by the Wobblies--the Industrial Workers of the World--with the idea that there should only be one union, worldwide, so that if workers anywhere were mistreated, all other workers would go out on strike in solidarity. In Paterson, most of the workers spoke very little English, so the strike organizers had to come up with simple songs and chants that everyone could understand. Sound familiar? Yeah. Like I said, I can recognize 1914 from here.